We open up the main website with our video project for a visual hook, which explains our topic in more detail and adds a human element. Beneath the video is an elaborated introduction explaining our mission, what journalism of care is, and how to use a “toolkit,” or in other words, our series of steps to help journalists and community activists exercise journalism of care. The first toolkit is made specifically for journalist use, and is created as a pdf document so users can easily download it. 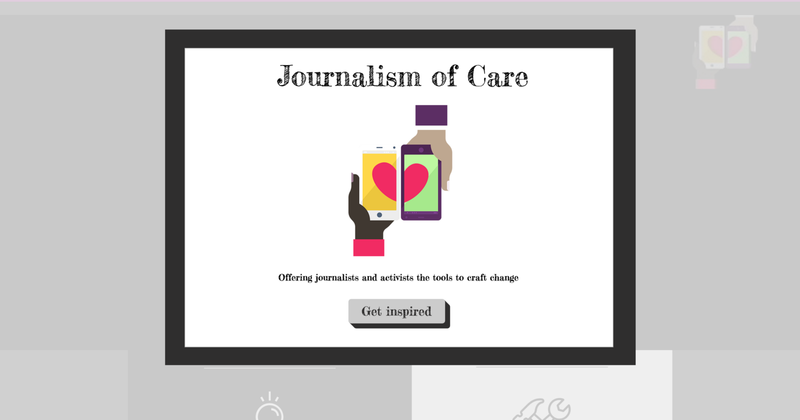 The toolkit includes the importance of caring journalism, key ways to develop care with subjects, the difference between being invasive and being immersive, a quiz to test how well you care, and a series of case studies of journalists who have exercised journalism of care. The second toolkit is made specifically for community activist use, and is created as a pdf document so users can easily download it. The toolkit includes the importance of being a caring and engaged community member, key ways to develop care in your community, the difference between caring about something and caring for something, a quiz to test how well you care, and a series of case studies of community activists who have exercised journalism of care. Next, we have two audio clips containing interviews expressing journalism of care examples. Lastly, our team defines how we personally define the theme of journalism of care, and what it means to us. We wanted to make the website clean and professional, so we avoided a lot of color. We also decided to make it black and white with shades of gray to illustrate the idea that the world isn’t yes or no, this or that, or black and white. There are gray areas mixed in, so we worked with them. We chose our logo because it incorporates this new rise of cell phone journalism as well as care. Our form of journalism has the purpose of connecting the community to make a change.